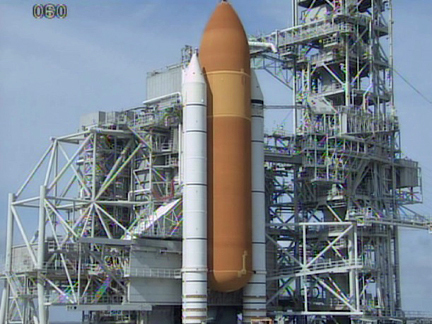 KENNEDY SPACE CENTER, FL--Forecasters are predicting a 70 percent chance of showers and thunderstorms Friday that could delay launch of the shuttle Atlantis on the program's 135th and final flight. But the chairman of NASA's mission management team says he plans to press ahead with flight preparations barring a dramatic change for the worse. "I only know of one way to make it a 100 percent no-go forecast, and that's to not put propellant in the tank," Mike Moses told reporters at a launch-minus-two-day news conference. "So I'll leave it at that. ... We've tanked at 90 percent no go and launched that day. We've also tanked at 20 percent (no) go and scrubbed that day. So, the forecast is a forecast, and even 12 hours out, it's still a forecast." Weather permitting, engineers will roll a protective gantry away from Atlantis at 2 p.m. EDT (GMT-4) Thursday, exposing the shuttle to view and setting the stage for fueling. Moses and the mission management team will meet at 1:30 a.m. Friday to assess the weather and to decide whether or not to load Atlantis' external tank with a half-million gallons of rocket fuel. "Before we go load propellants into the tank, we'll take a look at the weather and make sure it's really a good day to try that," Moses said. "And so at that point, we'll be making a decision." The three-hour fueling procedure is scheduled to begin at 2:01 a.m. Friday. If all goes well, Atlantis' crew -- commander Christopher Ferguson, pilot Douglas Hurley, Sandra Magnus and flight engineer Rex Walheim -- will begin strapping in around 8:06 a.m. to await liftoff on NASA's final shuttle mission. Liftoff is targeted for 11:26:46 a.m., the middle of a 10-minute window centered on the moment Earth's rotation carries the pad into the plane of the space station's orbit. Launch Director Mike Leinbach said local law enforcement authorities are expecting between 500,000 and 750,000 spectators, even more if launch slips into the weekend. Because of heavy traffic, Leinbach is reserving the option to skip a Saturday launch try if the weather triggers a scrub late in the countdown Friday out of concern the launch team could not get home and make it back to the spaceport in time for a 24-hour turnaround. As it now stands, Atlantis must get off the ground by Sunday or the flight will slip to July 16 to make way for launch of a military navigation satellite from the nearby Cape Canaveral Air Force Station. Shuttle managers may be able to make an attempt Monday, if necessary, without impacting the AIr Force launch, but no formal discussions have been held. "Everybody's already asking do we have plans to make them move and all that, and the bottom line is nothing happens until we can't launch, right?" Moses said. "We'll wait until we get there and see what we get." Winters said conditions should improve somewhat this weekend, with a 40 percent chance of good weather Saturday and a 60 percent chance Sunday. All in all, Moses said, the forecast leaves room for optimism. "If it's just cumulus clouds and rain showers, as long as we get a hole over the pad, which means we aren't going to fly through any (rain) and there's nothing in a 20-mile circle heading toward the pad, that'll be a 'go' day for us," he said. "It could be pouring rain everywhere else in the county, and if we get that hole in the right spot at the right time, we can go. So from that standpoint, right now I'm feeling pretty good about trying Friday. But we're not at Friday yet, so I'm not going to commit to anything until we get to Friday."